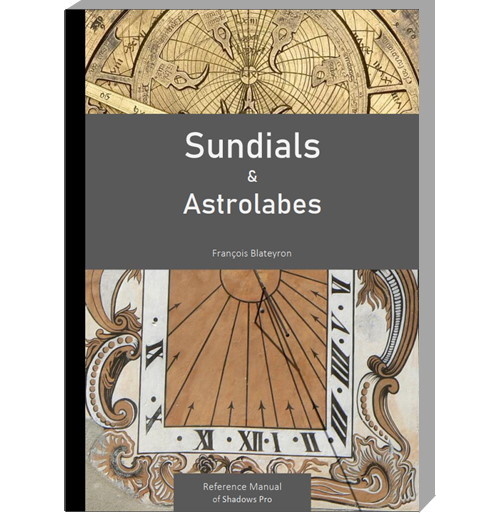 Continue to discover the world of sundials with the following resources. 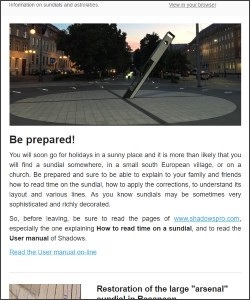 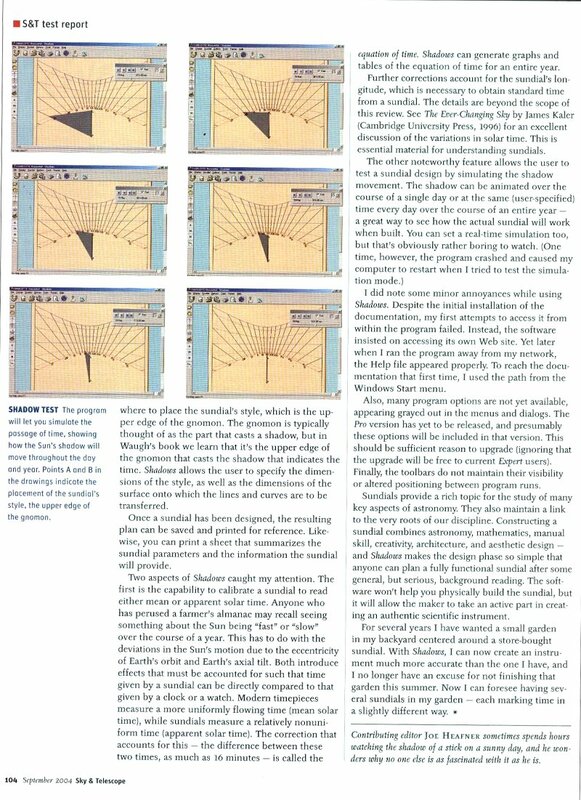 The user manual of Shadows is a genuine book on sundials and a practical guide on the software features to help you design, realize and install your own sundials. 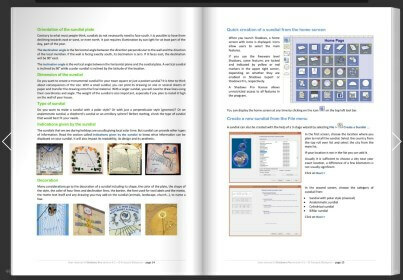 The manual features 110 pages illustrated in colors. 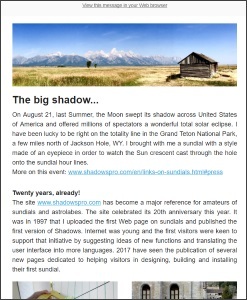 You may browse through it on line, download the PDF or obtain a paperback version printed in color and shipped by mail post. 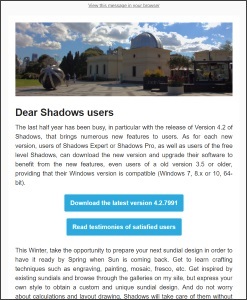 Browse to it page per page. 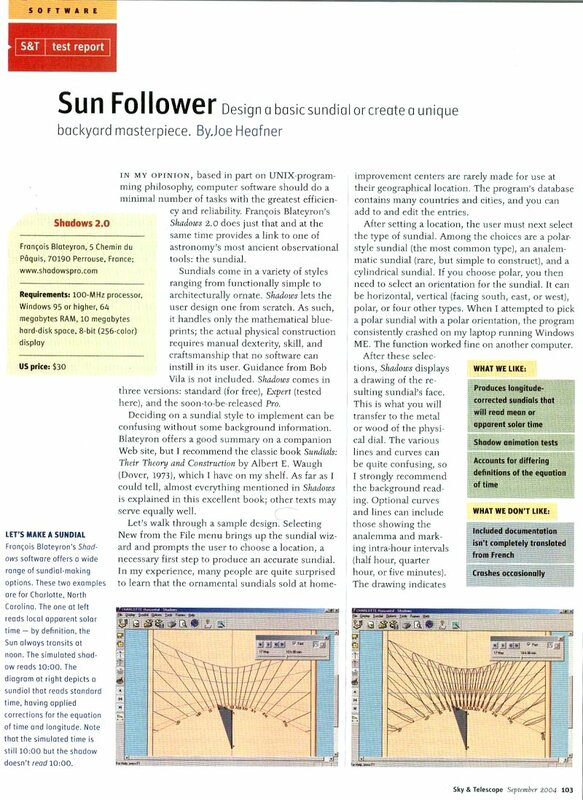 Order your paper version of the user manual using a print-on-demand service. 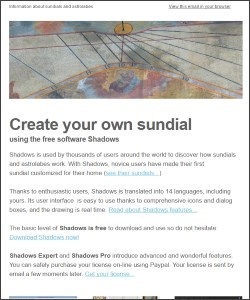 These documents provide step-by-step explanations on how to realize a sundial, and show how data calculated by the Shadows software are used. 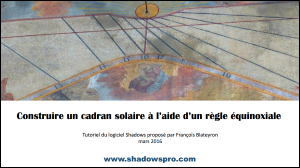 A sundial inspired by Mucha with (fake) painted tiles. 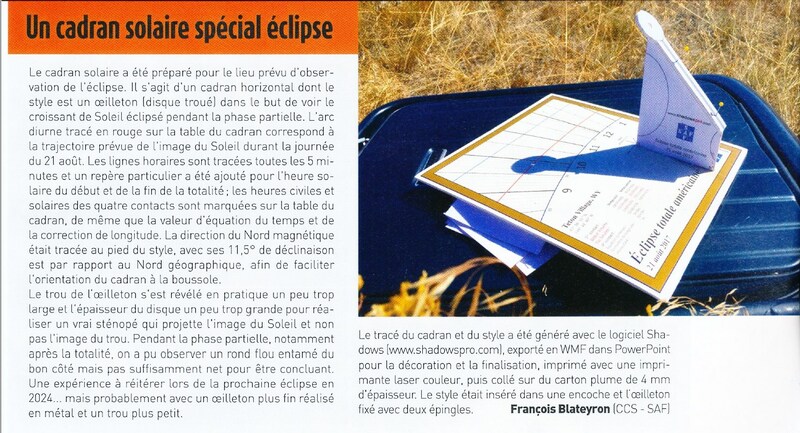 A style made of an eyepiece made from standard components found in retail stores. 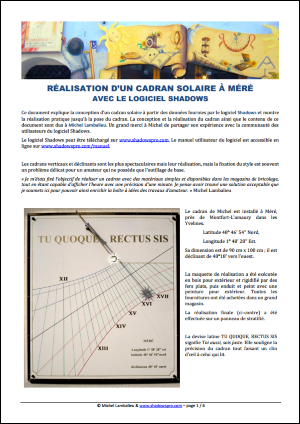 Tutorial on how to use the equinoctial ruler to ease the drawing of hour lines on large sundials. 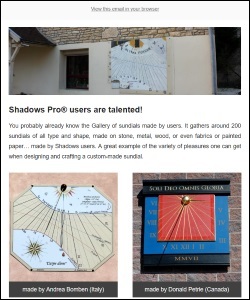 The following museums display collections of portable sundials. 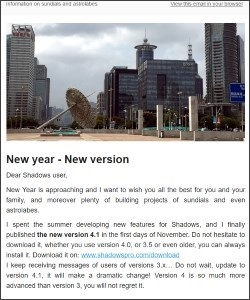 Stay connected to the latest news on the Shadows Pro page on FaceBook. 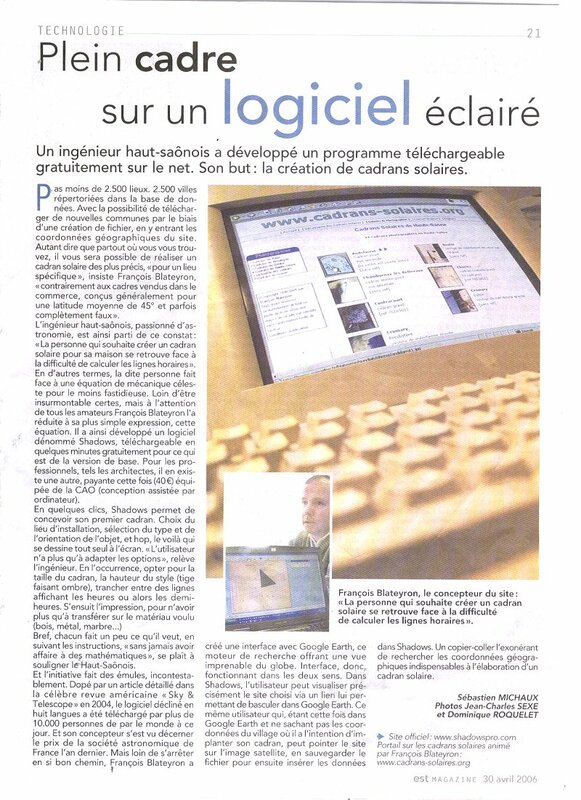 Video report broadcasted on July 24th, 2007. 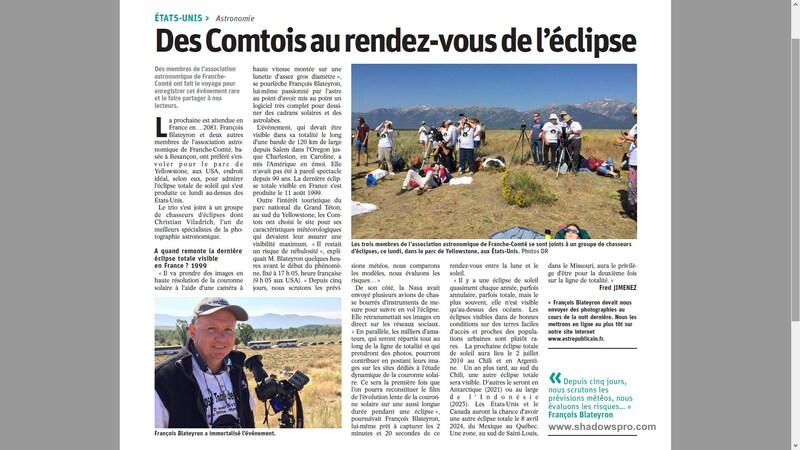 Journalist: Isabelle Brunnarius, cameraman: Laurent Brocard. 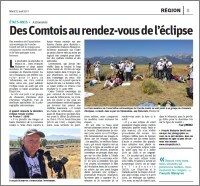 Week-end edition, East of France. 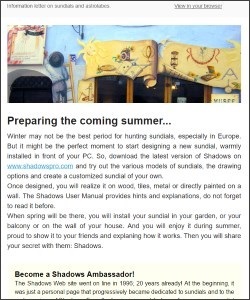 Test of Shadows version 2.0 by Joe Heafner. 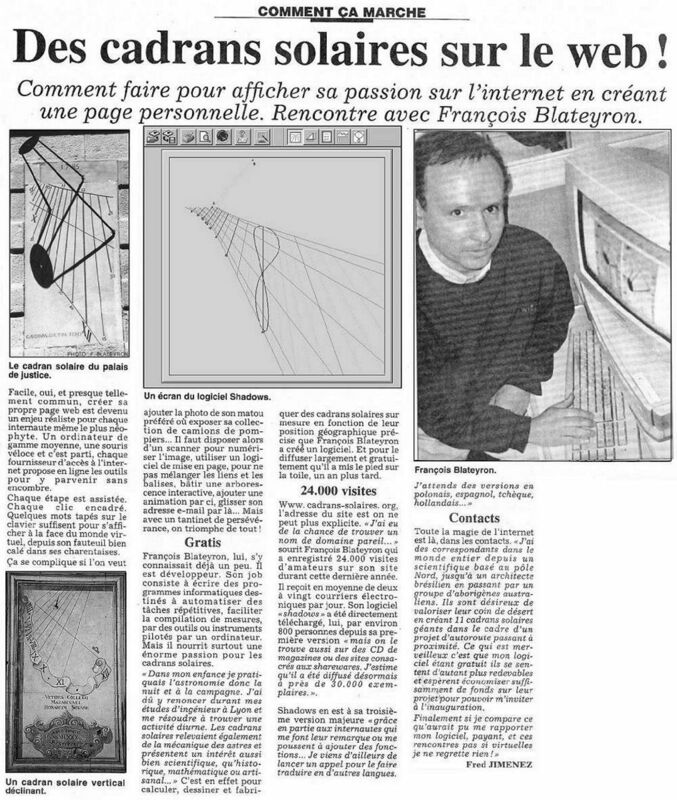 Published on October 9th, 2000. 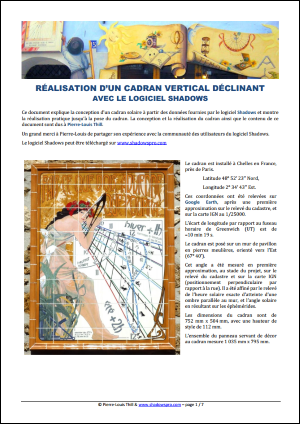 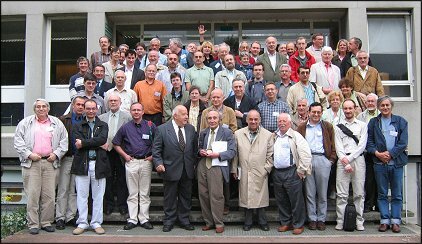 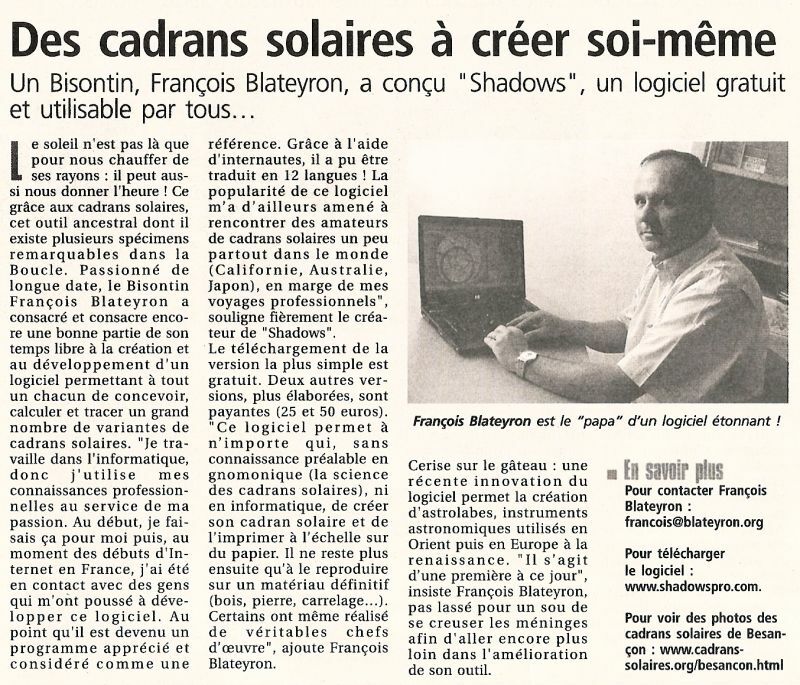 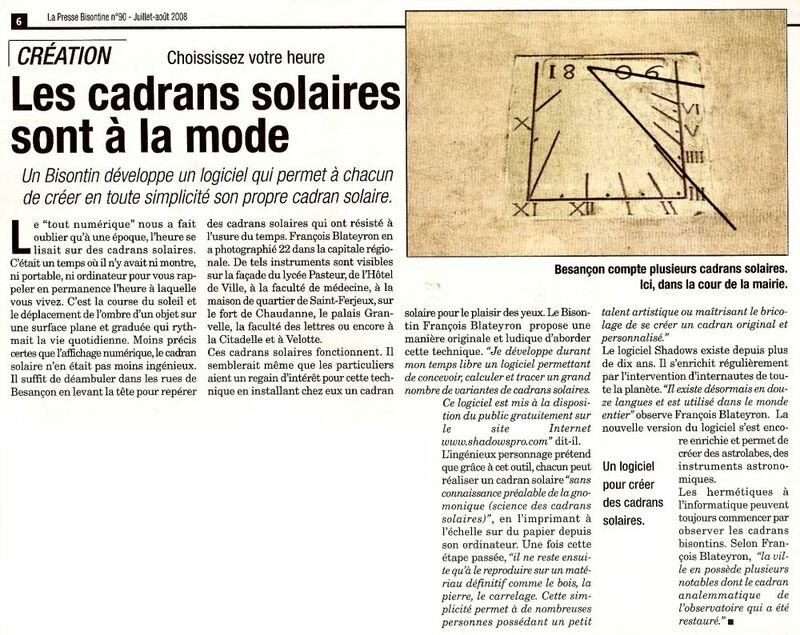 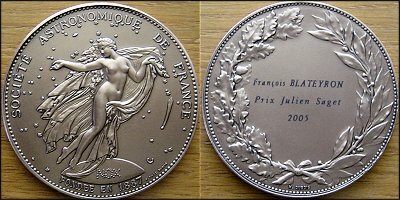 Société Astronomique de France awarded François Blateyron with the Julien Saget prize in 2005, for the development of his Shadows software and his work on sundials. 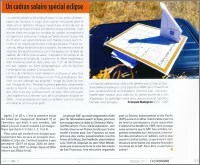 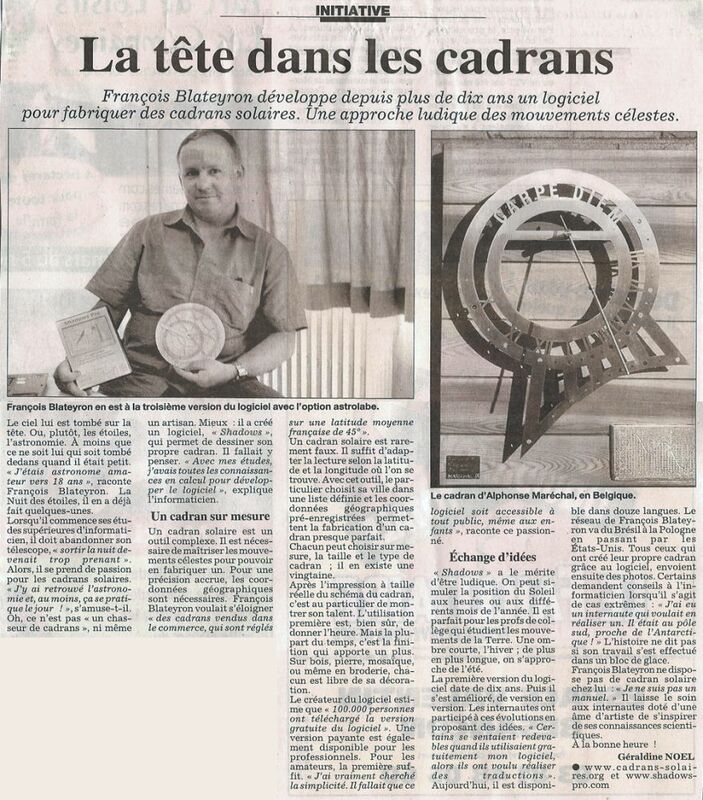 The prize was given by Denis Savoie, President of the French Sundial Commission at the Meudon Observatory, Paris. 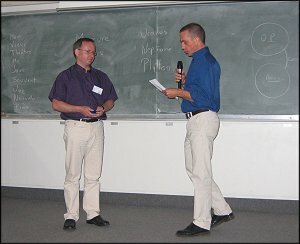 Minutes of the day and prizes.